We asked some experts for advice to keep your umbrella from turning into a dangerous weapon. After a long, dark, cold winter, you’ve finally made it to a warm summer day at the beach. But it’s windy – typical New England – and you struggle to plant your umbrella in the sand. Then, just as you get to the best part of your novel, you’re blinded by sunlight, and your beach umbrella is on a path toward disaster. All you can do is run after it and hope for the best. Fear not: I’ve consulted some experts. Their advice will bring you the shade and serenity you’re seeking, while preventing your umbrella from becoming a beach missile. Falmouth’s acting beach superintendent, Bruce Mogardo, says umbrella accidents at beaches in the Upper Cape town are a relatively rare occurrence – once or twice a summer – because his lifeguard team is proactive about preventing them. But umbrellas are still a danger, he warns. “You’ve got a canvas end and you’ve got a pointed end. And once that wind starts taking off, it’s going to tumble, it’s going to spin, and you don’t know where that pointed end’s going,” he says. 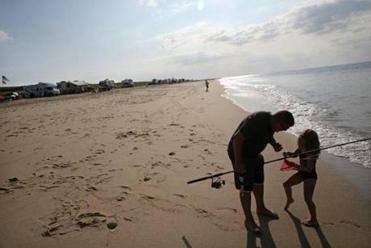 Get to the beach early, before it’s crowded, so you can stake out the right location. Norbert Yankielun, formerly a researcher with the US Army Corps of Engineers Cold Regions Research and Engineering Laboratory in New Hampshire and now a consulting electrical engineer, says it’s a good idea, if you can, to set up by a dune or a building that can act as a windbreak. Beaches with larger, coarser sand grains (typical of New England) tend to be steeper, according to Rob Holman, an oceanographer based in Oregon who created the Argus coastal-imaging program — and the proud owner of nearly 1,000 samples of sand from around the world. This slope can make setting up your umbrella more difficult. Try to find a flatter area that is closer to the water but still has a dry top layer. This way, the sand you’re lying on is comfortable, but just under that is wet sand that will help your umbrella stay put. 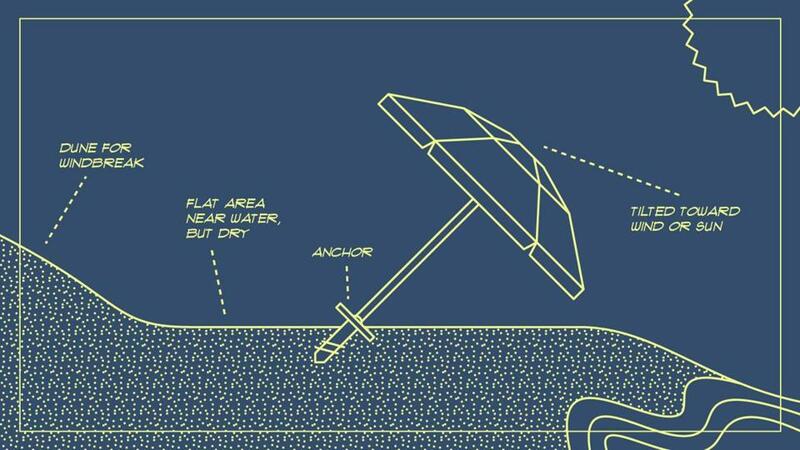 The “dead man” can be used instead of a sand anchor to secure beach umbrellas. Yankielun recommends a “dead man,” which can be used with or instead of a sand anchor. When he’s building an igloo – he’s considered an expert at it, and says the same engineering techniques apply to sandier locales — the “dead man” is often a log buried in the snow, with a cord tied around it and attached to whatever needs to stay put. 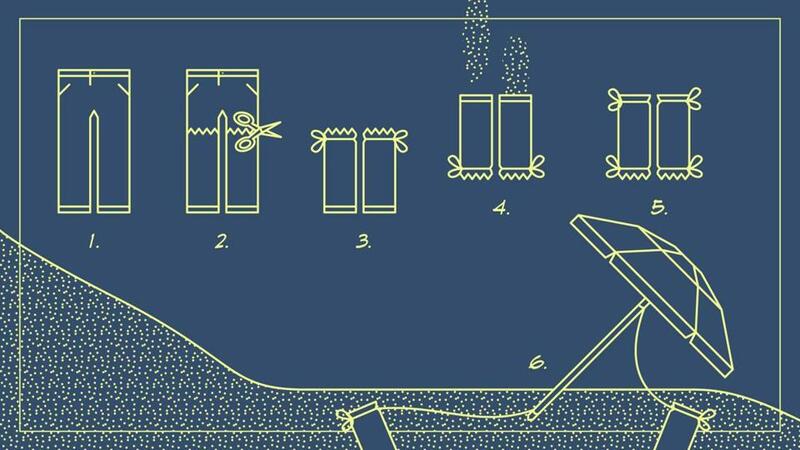 This mechanism can work in sand, too, but nobody wants to lug a log to the beach. Instead, take an old pair of pants and cut off the legs. Tie or sew one end of each leg to create two tubes, each with one closed end. “So you go to the beach with your two pant-leg tubes, and . . . let’s see, what can we fill them with at the beach that’s heavy?” says Yankielun. “Oh! We could put sand in them.” Once filled, the pant legs should resemble logs, with one end fastened and the other end open. Tie a long piece of cord around the open end, then bury your “dead man” beneath the sand and attach the other end of the cord to your umbrella. You can tie one filled pant leg to the top of the umbrella and the other to the pole, for example, if you’re leaning it to the side. If the umbrella is going to point straight up, you might tie both “dead men” to the top and bury them on either side. Remember, the wind can shift direction and send your umbrella sailing. To keep visual track of the wind direction, Yankielun suggests two possible techniques: Tie a piece of ribbon or other lightweight material to a stick planted in the sand or to the arm of your beach chair. When the ribbon starts flapping in a different direction, you may want to reposition your umbrella. An even easier way to check the wind direction throughout the day is to “pick up a handful of dry sand and hold it about a foot or two or three off the ground and just drop it” and see which way the wind pushes it, he says. Make sure it’s fairly low to the ground – you don’t want to risk annoying your beach neighbors by getting sand in anyone’s eyes. After the wind changes, don’t wait for your umbrella to start wiggling. Go ahead and shift it so that the top faces the wind. While it might seem counterproductive, securing your umbrella is part of being a responsible beachgoer. “Make sure it’s well anchored, and make sure that you constantly check it for safety issues,” says Mogardo. And if it’s really windy, be safe and take the umbrella down. Katja Vujić is an undergraduate student at Emerson College and a freelance writer.